Pure-bred cocker spaniel Lady meets the handsome stray known as Tramp, and the result is one of the most beloved romances to ever grace the screen, a doggie Romeo and Juliet story, with the added bonus of a happy ending. Over the course of lovely Lady’s romance with the roguish mutt, the pampered pooch encounters a colorful cast of canines, from next-door-neighbors Trusty the Southern gentleman bloodhound and Jock the proud Scottish Terrier to Peg the faded show dog. There’s also the sneaky Siamese cats Si and Am, Jim Dear and Darling’s new baby and Lady and Tramp’s son, a real little “scamp.” This cavalcade of unforgettable moments (including Lady and Tramp’s romantic “Bella Notte”) is unleashed in celebration of Lady and the Tramp’s 50th anniversary. 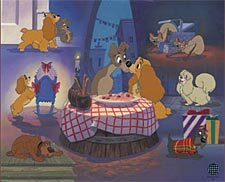 This limited-edition sericel recreates several key moments featuring the much-loved canine cast from Walt Disney’s Lady and the Tramp (1955). The gentle and nostalgic animated feature told from a dog’s eye view reached the screen after almost two decades of development. The charming story of Lady began with an oft-told anecdote of Walt Disney presenting his wife with a cocker spaniel puppy in a hat box, but the specific genesis came from legendary preproduction and story artist Joe Grant. In the late 1930s, Joe drew up countless inspirational drawings about his family pet, a pampered cocker spaniel named Lady. Included in the concept were two sneaky Siamese cats, a Scottie dog-next-door, and a birth in the human family inspired by the birth of the artist’s daughter. A romantically inclined mongrel was eventually added to the storyline, the mutt’s name evolving from Homer to Rags to Bozo and finally to Tramp. When the film went into full production in the 1950s, sultry vocalist Peggy Lee composed the film’s songs along with Sonny Burke, and also provided the voices of several characters, including Si and Am and Peg. Animator Eric Larson studied Peggy Lee’s seductive performance of “He’s a Tramp” in animating the aging showdog. “The way she sang the song was a great inspiration,” Eric later recalled. “Also the way she walked. Because she had a pretty nice movement and these are things that you try to pick up from the human being and translate into the animals.” The delightful result is reflected in this interpretive artwork, a canine kaleidoscope of favorite moments and unforgettable characters from one of Walt Disney’s loveliest animated features. This edition is a Limited Edition Sericel created by Disney artists. Twenty-six colors were used to faithfully convey the richness of each scene. Included with this edition is a mat with a printed remarque of the Lady and the Tramp anniversary logo.